Hi everyone, thank you so much for stopping by today! 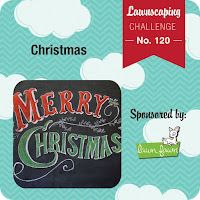 Not only could I not resist one more Christmas card, this card is for the Lawnscaping Challenge #120 "Merry Christmas" sponsored by Lawn Fawn. After doing so many snowflake themed cards and winter scene cards, I thought it might be nice to mix it up a bit. Today's card features five adorable Lawn Fawn critters out Christmas caroling. 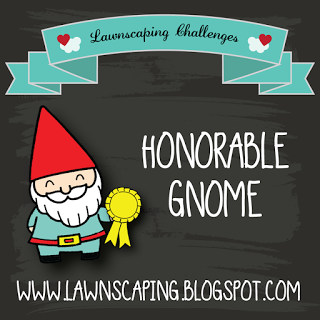 Honorable Gnome for the Lawnscaping Challenge! WOOHOO!!! Thank you all so much for your support and encouragement. I'm so happy to be part of this community. Trina! This is adorable! I love this. BRILLIANT! This is so so cute! I love the caroling critters!! Thanks for playing along with Lawnscaping Challenges! Very cute card! Love the colors! Thank you so much for playing the Lawnscaping Challenge! I must say I love your blog Trina, we seem to love the same things: flowers, coloring and even critters! Maybe you'd like to visit my blog too, it's "brand new" although I have been blogging for years already... But I switched address quite recently.